A paean to the passage of time in old London domestic interiors. What is it about old pine panelling layered with flaking paint that enchants the eye and tugs at the heart? The soft shine of wooden boards, worn and gappy. Sunlight shafting through an open door out to an unevenly flagged yard where a clay pipe might turn up alongside a Thames oyster shell or a pottery shard. 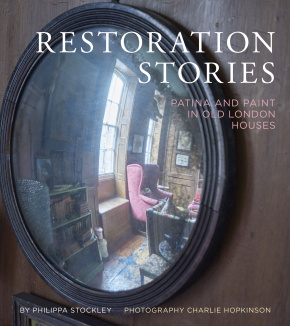 Blue-and-and white export ware; the molten lustre of mahogany or worn silver; the curiosity of tricorn hat boxes or a fragment of Spitalfields silk; portraits whose owners might once have lived here. Would they have believed that these houses would stand 250 years later? Time has imbued all these things with unforgettable patina − not only in museums, but even more in old Georgian houses still lived in and loved, repaired, and regenerated. Like pearls, warmed to lustre by the daily caress of a hand or foot. The majority of these extraordinary dwellings began as ordinary terrace houses, built to a pattern, often in pairs or small groups. Clusters exist in the East End of London: in Spitalfields, Whitechapel, Shadwell, Mile End. They are mostly Grade II-listed, and their owners put up with the bone-curdling cold of winter howling through gaps, with mending and colour-matching, patching and piecing. Not just put up with − they embrace it. And among them are some unrepentantly furnished with 20th- and 21st-century modern, finding poetic harmony across the centuries.